SALE! Reserve now and we pay your cleaning fee! Almost $450.00 savings! 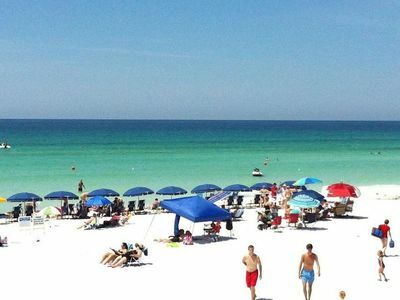 Located on the “beach side” of 30A, Beach Music is as relaxing as the name suggests. Our 3421 sq. ft. home is great for multiple families or large groups. We now offer king-size accommodations in four of the bedrooms. Our home spans three floors, with three separate living areas and two full kitchens, which allows for more privacy than most homes would offer. 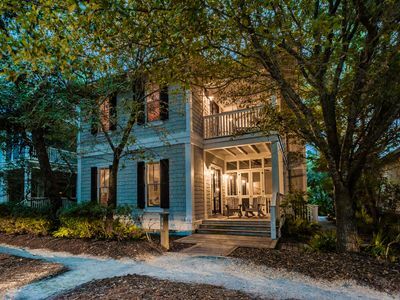 It is designed to handle a crowd with a total of 6 bedrooms and 4 baths, comfortably sleeping 18. 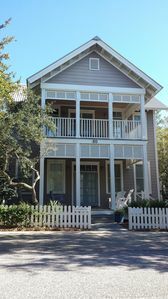 Entering Beach Music from the front entrance or garage allows you direct access to this fully outfitted dwelling. This space is perfect for those with children and/or teenagers with a bunk room for 4 and a full kitchen at your disposal. Additionally, the PRIVATE POOL is just outside the back door, with an alarm on the outside and the inside of the door to protect children. 2. Full Kitchen: Includes stove, oven, microwave, full-size refrigerator (with ice maker), garbage disposal and dishwasher. The kitchen is stocked with all you might need for a quick bite or a full meal (pots/pans, dishes, glassware and utensils). 4. 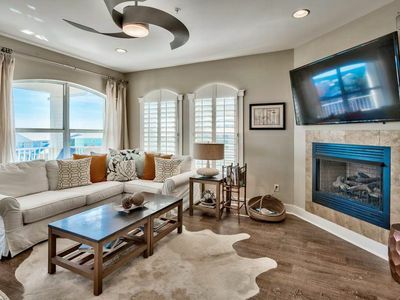 Sitting Area: Offers a flat screen TV with DVD player and seating for relaxing. 5. King Bedroom: Includes new king-size mattress and bedding, large closet and flat screen TV. 6. Bunk Room: Includes two bunk beds (four singles), flat screen TV and very large closet – it is perfect for kids coming in/out from the pool or beach. Garage/Driveway: The garage can house one full-size vehicle inside with room for four more in the driveway. You can also use the garage to store your boogie boards, chairs and beach items. Ascending the stairs from the ground level, you enter the second floor which houses the majority of the sleeping quarters. This area is designed to be a peaceful getaway from the excitement of the pool/beach on the 1st floor and those congregating on the 3rd floor. 3. King Bedroom #1: Includes new king-size mattress and bedding, two large closets and flat screen TV. 5. King Bedroom #2: Includes new king-size mattress and bedding, sizable closet and flat screen TV with DVD player. 6. 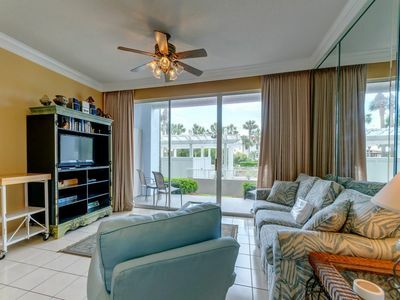 Master Suite: Master Bedroom includes king-size bed, flat screen TV with DVD player and a private balcony. The Master Bath offers an oversized walk-in shower, large double-sink vanity, private water closet, linen closet and huge walk-in closet. **Walk-in closet is off the private master bath. We have used it often to house two pack-an-plays/sleepers for infants and toddlers. Covering the greater part of the 3rd floor, this vast space is where the fun happens! 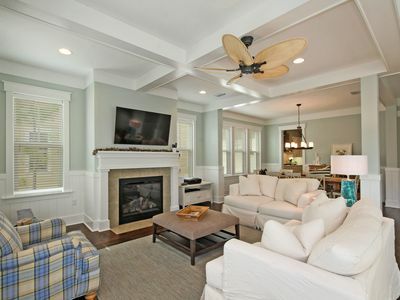 The open floor plan makes it is perfect for entertaining and large family gatherings/meals. 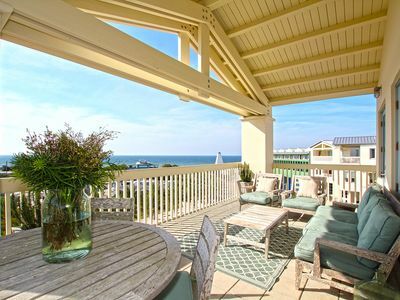 With scenic views of 30A and the gulf from the numerous windows and outdoor balcony, we find that this is where people spend most of their time - you will not be disappointed! 8. 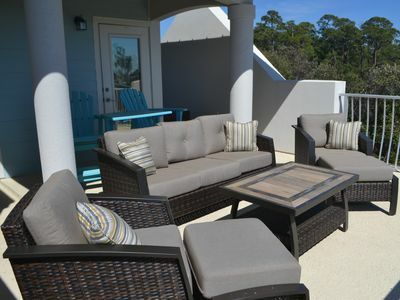 Large Balcony: The balcony, which expands the width of the house, includes patio furniture to relax with your morning coffee, overlooks the pool below, and has a view of the ocean. With your very own private pool and the beach just steps away, Beach Music is a win-win! 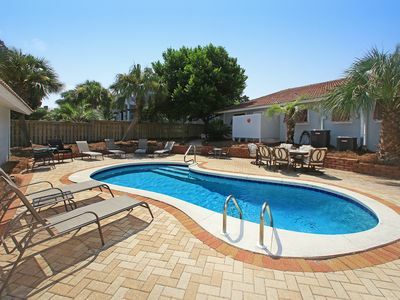 Our refreshing pool and lounge area are located just outside of the backdoor. 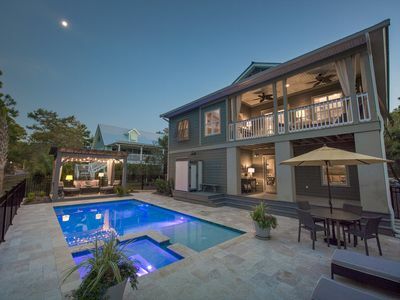 The kids (and adults alike) will love taking a dip in the pool after a long day at the beach. It’s also a great area for quick lunches and/or casual dinners. 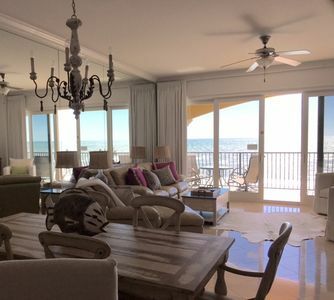 Private Boardwalk: Take a short stroll down our private boardwalk (~100 steps) to what the world calls “The Emerald Coast” and what we refer to as “heaven on earth.” You will love the sugar sand and crystal blue water that will be yours to enjoy each day. The beach is an easy walk to/from the house for transporting beach items and/or bathroom breaks. Semi-private Beach: Beach Music is located amongst six homes that claim the beach located directly in front of our properties. We are also a short drive away from the newest attraction 30A has to offer – The Hub, located in Seacrest, which is just up the road. If you haven’t been, you must check it out – great for families and children. 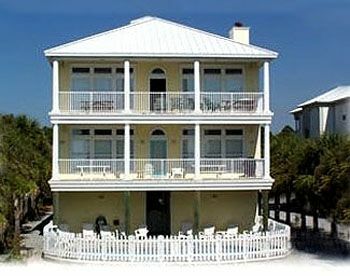 Beach Chairs: The house is outfitted with a number of beach chairs stored in the garage and are available for use. Beach Towels: There are several beach towels provided and others left by past guests that you are welcome to use; however we encourage you to bring a few with you. Extras: Other beach toys, rafts, boogie boards, etc. are left throughout the year and are yours to enjoy. Bike: A great bike rental company is directly across the street from the house. *Sport Tents/Umbrellas: We DO NOT provide tents or umbrellas as they tend to break and/or disappear; however we highly encourage you to bring them with you for use on the beach. Note: Chairs and umbrellas can be rented daily on the beach or rented from nearby vendors. WiFi/Cable TV: Free WiFi and cable are available throughout the house. Thank you for exploring our home. We hope you consider Beach Music for your next vacation destination. Please do not hesitate to contact us if we can answer any questions about the house and/or area. Gulf Place Cabanas 104 - Your spring NW Florida vacay awaits. RECENTLY RENO'D! LUXURY TOWNHOUSE w/ LOTS OF AMENITIES! CHECK IT OUT! "Boathouse" ~ Ping Pong Table & Large Deck! 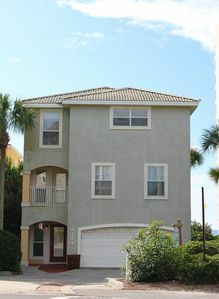 Close to Watercolor beach club! SUMMER SALE - Private Pool, Bikes, Close to Seaside and Gulf, Designer! Relaxing oasis at the beach! 2 Pools! Tennis! Lake! Shuffleboard! SEAVIEW HIDEAWAY! OPEN 8/10-17 ONLY $3305 TOTAL! BOOK ONLINE AND SAVE! 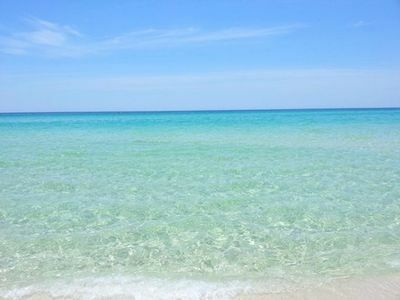 Seagrove Beauty! 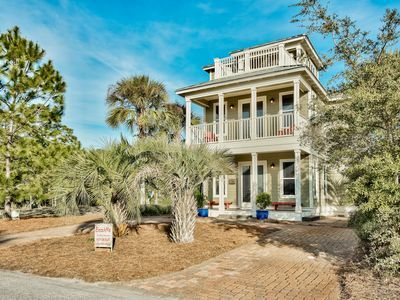 4 BR - pool, beach shuttle, bikes!